The demolition phase of the Court Facility Improvement Project is underway and on schedule. Top priorities for this phase include the structural protection of Franklin County’s historic courthouse as well as the proper removal and disposal of hazardous materials. “Thoughtful demolition and hazardous materials abatement plans are essential to preparing the project sites for redevelopment,” said Commissioner Chairman Dave Keller. Demolition contractor Lycoming Supply, Inc. presented plans for both in advance of the demolition phase of the Court Facility Improvement Project. The Old Courthouse, built in 1865 after the burning of Chambersburg by the confederate army, is located less than 15 feet from the Chambersburg Trust building which is slated for exterior demolition in mid-February. The demolition contractor is under strict orders to work with the utmost care and precision when demolishing the bank building. In addition to pulling the adjacent wall of the bank building away from the Old Courthouse, there will be chain link fencing hung between the structures for extra protection. Plywood barriers are currently in place to protect the Old Courthouse windows from debris. The demolition crew is working to salvage architectural elements from the interior and exterior of the Chambersburg Trust building. 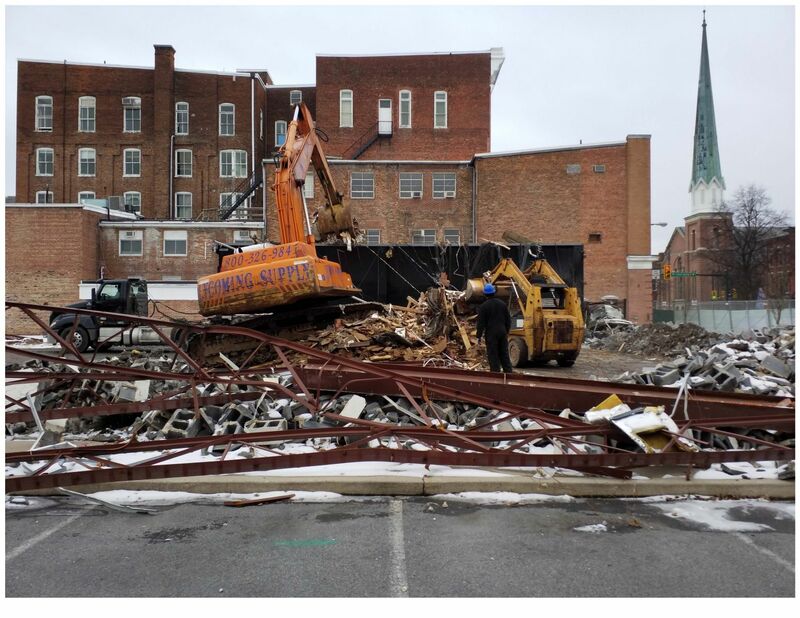 The former 'Lighten Up' building (34 Main Street) and Sheetz building (North Second Street) are now down and demo crews are clearing the sites. Structural materials such as wood, metals, concrete, asphalt, brick and block are sorted in piles for recycling. “The County is recycling as much material as possible. It minimizes the amount of debris sent to the landfill,” said Project Manager John Hart. Hazardous remediation efforts to safely remove and dispose of asbestos and lead paint should be completed for the Chambersburg Trust Building in the next couple weeks and by mid-March for the Wogan’s building. Exterior demolition for each building will begin once remediation is complete and pending any weather related delays. Demo crew works to seperate wood, metal and concrete block for recycling. The Court Facility Improvement Project was proposed in January 2018 to address long standing needs for safety and security of those visiting and working in court offices, adequate space to meet the demands of a growing county, and for co-locating court offices and services onto one courthouse campus for efficiency and convenience. In addition to a judicial center and administration building, the project includes renovations to the Courthouse Annex, Old Courthouse and building at 340 N Second Street for Archives. More information can be found at www.franklincountypa.gov or e-mail: facilityprojectinfo@franklincountypa.gov.